SEOUL, Jan. 23 (Yonhap) — The second season of JTBC’s popular reality TV show “Hyori’s Home Stay” will premiere Feb. 4, the network said Tuesday. For the show, the celebrity couple — singer Lee Hyo-ri and singer-songwriter Lee Sang-soon — turn their home on the southern resort island of Jeju into a bed and breakfast. The first season aired from June 25 to Sept. 24, with its highest viewership rating reaching 9.9 percent. Singer-songwriter IU made an appearance as an employee. The new season focuses on the winter scenery of the island and new hire Yoona, actress and member of K-pop girl band Girls’ Generation. 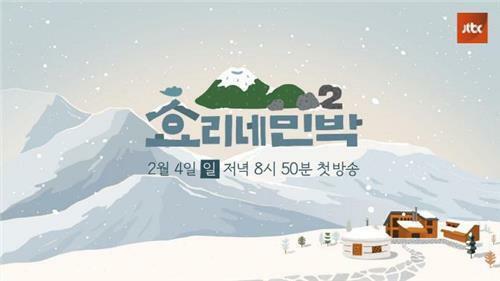 The program’s logo for the second season, unveiled Tuesday, shows Hyori’s house and a Mongolian “ger,” or yurt, in the front garden against the backdrop of a snowy Mount Halla. The show will be broadcast at 8:50 p.m. every Sunday.